HORSESHOE BAY, TX -- On a cool Hill Country day in early spring two Horseshoe Bay residents, Lewis Coalter and Edwin Finley, teed it up on the famed Ram Rock Course and didn't mind at all that the layout was tough and unforgiving. They know on any given day it could bring them to their knees. Here's a couple of retired guys who once lived in the flatness of scenery-challenged Lubbock and were just thankful they were able to experience one of the world's premier golf resorts any time they wanted. Lubbock in their rear-view mirror never looked so good, even though they both said they once loved living on the South Plains. On the tee at No. 11 they pointed to an awesome home and said: "That's where Spike Dykes lives." The affable former Texas Tech football coach, too, had seen Lubbock far behind him, after retiring last season. 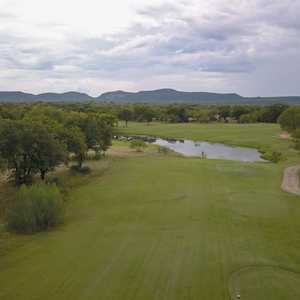 They enjoy the scenery, the bluebonnets, the granite-rock outcroppings, an occasional birdie and a stretch of holes at Ram Rock that would challenge any golfer. "Augusta has its Amen Corner," Finley said. "But we have one too. Holes eight through 11 at Ram Rock have more trouble than you ever could imagine." When they arrive at the 16th, a mean par 4, 376 yards, with water to carry and a blind second shot (for shorter hitters) to a tiny, long, narrow green, Coalter says, with a wink, "There ain't no green there", in reference to a minuscule target that has water right and a huge bunker left. Just the day before another former Lubbock resident and Texas Tech graduate, Gary McWilliams, a San Antonio physician, played Applerock and Slick Rock in one day. He said: "If your driver isn't working you will be. These courses reward a good drive with manageable approaches to the greens, but you will be praying for your bogey if you botch the big stick, which I did on more than one occasion. "When you play these courses at Horseshoe Bay you should take time to enjoy golf the way it once was, when missing the fairways meant you were in knee-high grass instead of in someone's backyard. Even the sting of a bad score won't last for long if you take time to soak up the beautiful Hill Country all around you," he said. Horseshoe Bay Resort, Inn and Conference Club is a world-class residential and resort community developed in the early 1970s on the shores of Lake LBJ, one of the seven Highland Lakes formed by the damming of the Colorado River. If you have heard some naysayers recently say Horseshoe Bay was losing ground on the competition in Texas, forget it. The Resort, with two other courses, Applerock and Slick Rock, still have it. And coming soon is a fourth course named Flintrock. While Horseshoe Bay picked master golf architect Robert Trent Jones, Sr. to design its first 54 holes, they selected Jack Nicklaus to plan Flintrock, which should be opened in 2001. Horseshoe Bay is conveniently located in the "Golden Triangle" of Texas -- 218 miles from Houston, less than that from Dallas/Fort Worth (200) and San Antonio (80), and the State Capitol of Austin is just about an hour southeast of Horseshoe Bay or 43 miles. It is just minutes from beautiful Marble Falls. The average temperature in Horseshoe Bay is 52 degrees in the winter and 84 degrees in the summer and Lake LBJ, which is 23 miles long and has 150 miles of shoreline can help you cool off with all kinds of swimming, boating and fishing fun. 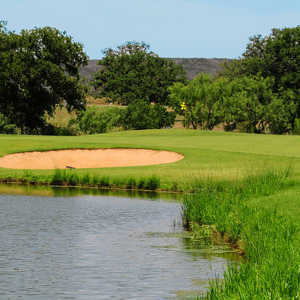 Ram Rock is respected throughout Texas as one of its toughest layouts. There's an island green at No. 4, 191 yards from the rear, and the greens are slick bent, the only Horseshoe Bay course that has retained this quick putting surface. You have it all here -- narrow fairways, natural streams, ponds, sand, rock gardens, granite outcroppings, a blind tee shot and 60 bunkers. Water will test you on 10 holes. The Ram Rock par-71 layout is 6,926 yards long and is called the beast among beauties of the 54 holes at Horseshoe Bay. It opened in 1981, and has been host to the Texas State Open, as well as several other USGA qualifying events and local professional tournaments. It is ranked No. 21 on Golf Magazine's Top 100 You Can Play list. Opened since 1985, Applerock has also been host to the Texas State Open, many other USGA events, as well as local professional tournaments. Golf Digest named Applerock the Best New Resort Course in America the year it opened and the par-3, 12th at 179 yards from the back, is the signature hole on the banks of Lake LBJ. It's all carry. 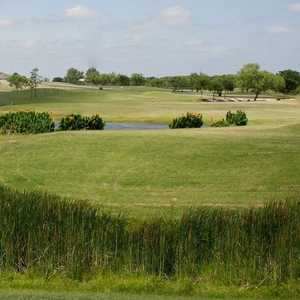 You start your round at the highest point of the property with views of the hills and Lake LBJ. Back-to-back par-5 beauties are at 10 and 11, going downhill toward the lake and the water-surrounded 12th. Don't be surprised when you see huge hunks of native granite in the sand traps or black lava rock in the stream beds. It's all part of the natural beauty of the Hill Country with native oaks and elm trees lining the fairways. Applerock, par 72, 6,999 yards from the championship tees, also features more than 50 bunkers and water coming into play on seven holes including Lake LBJ. Some elevated tees will also give you a better view. And last year Applerock was closed to install new tiff dwarf Bermuda greens that will be much more tolerant to the Texas heat. Applerock is No. 83 on Golf Magazine's Top 100 You Can Play list. Slick Rock started it all in 1972 and has a spectacular man-made million-dollar waterfall at No. 14. After you snap a few pictures of this marvel, your tee shot has to clear it on the par-4, 361-yard hole. You then drive through Slick Rock Creek in a low-water crossing, tires in a couple of inches deep, and the route winds right beside the falling water, close enough to touch. The 154 acres of Slick Rock meanders 6,839 yards at par 72 over gently rolling green terrain broken only by 72 sand traps, challenging ponds and 12 holes with water in play and large rolling greens. Resort guests green fees are $132.00 weekdays and $149.99 weekends. From Dallas, Take I-35 South. Horseshoe Bay is on FM 2147, 5.5 miles west of 281, at Marble Falls -- or 2 miles east of the intersection of FM 2147 and U.S. Highway 71. There are various room types and locations available at Horseshoe Bay Resort. The Horseshoe Bay Inn and 2 or 3 bedroom condos. Call for pricing and availability. Ram Rock: Golf Digest: No. 40 Top 75 Resort Courses. No. 3 Best in Texas. Rating: 4.5 stars. Golf Magazine: No. 21 Top 100 You Can Play list. Applerock: Golf Magazine: No. 83 Top 100 You Can Play list. No. 4 Best in Texas. Rating: 4 stars. Golf Magazine: Three-time Silver Medalist Award Winner. Slick Rock: Golf Digest: 4-Star Rating. The Yacht Club, with several dining rooms, offers either elegant or business casual dining with the chef preparing a variety of foods. La Bahia restaurant offers upscale Mexican cuisine in a casual to business casual atmosphere. Or visit any of the Bar & Grill's located at the Slickrock and Cap Rock Pro Shops for a more casual atmosphere. The Tennis complex has 14 Tennis courts offering hard courts, red clay courts and pro grass courts.